This PDF 1.7 document has been generated by Microsoft® Word 2016, and has been sent on pdf-archive.com on 06/01/2018 at 12:24, from IP address 108.80.x.x. The current document download page has been viewed 170 times. page. In Part II, you will be asked to respond to several broader, open-ended questions. 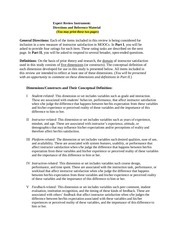 Student-related: This dimension or set includes variables such as grade and interaction. difference to him or her. and the importance of this difference to him or her. of these variables and the importance of this difference to him or her. examining the proposed items. You are asked to rate the following four aspects of each item. indicate if you feel any item should be eliminated. of instructor satisfaction are identified and/or defined? adequately address all salient aspects of each of the five identified dimensions? This file has been shared by a user of PDF Archive. Document ID: 00717668.